I did spend Friday, April 8, 2011. wandering the floor of the Armory Book Fair in New York City. The collection of book sellers was world class and I was mostly in a state of utter amazement at the books displayed and for sale. This is definitely a "high spot" book fair and I was not in a buying mood so I mostly browsed. I did see a copy of Albert Camus, The Plague, Hamish and Hamilton, London, 1948, first edition, first printing, in fine condition with various slight chips and tears on the dust jacket, for sale, $1000. 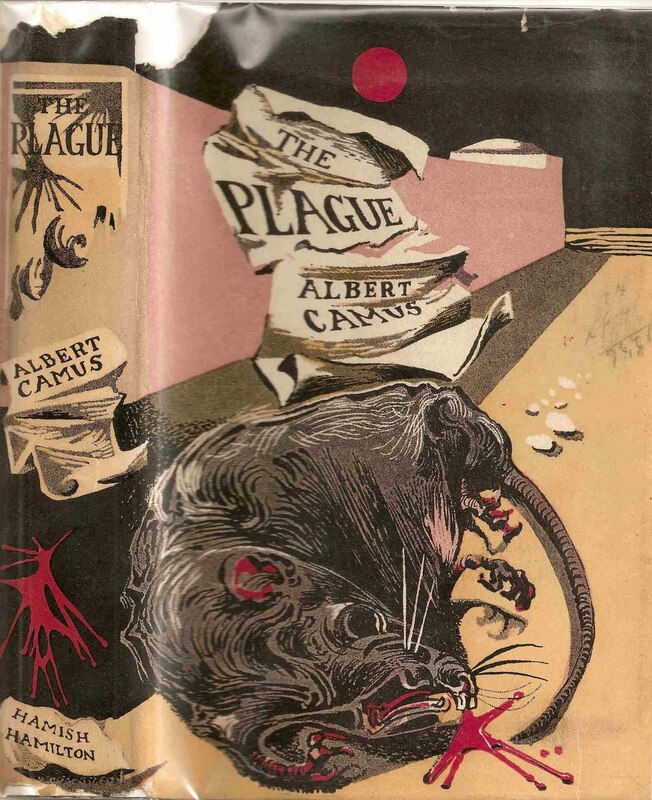 I own a copy of this edition and also the first American edition, Alfred Knopf, 1948, and upon return to my library, I decided to study my copies in comparison to what is for sale today, especially, the $1000 copy Hamish and Hamilton edition I saw at the Armory fair. 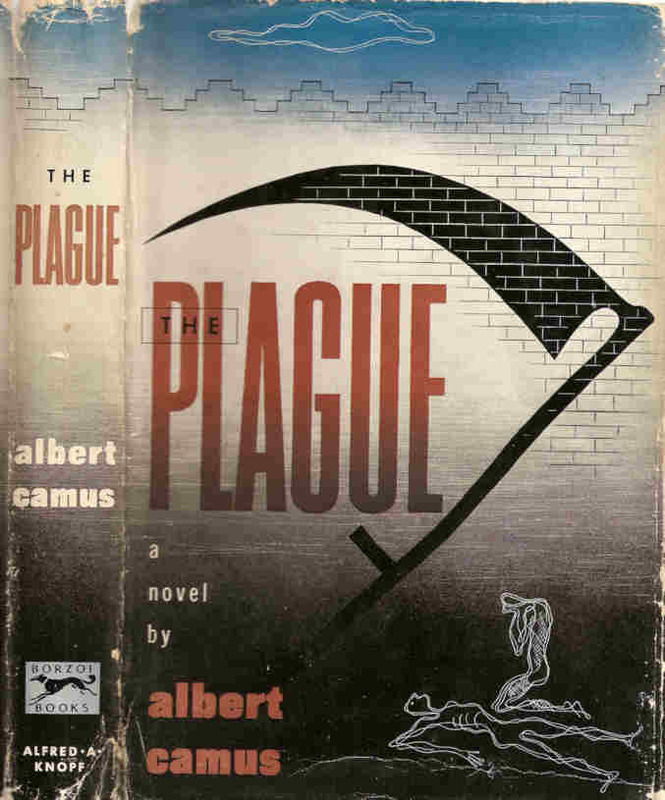 Camus, The Plague, is rightly, considered one of the most powerful novels of the 20th century. 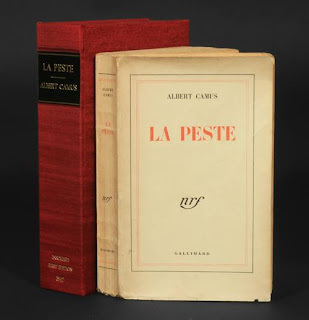 I actively collect Camus in English and since my goal remains collecting what I love reading, acquiring both the London and New York, first edition, first printings of Camus was a priority goal as well as very satisfying. I love both the content and the cover treatments! My Hamish and Hamilton edition is in fine condition with a dust jacket in good condition with a small, 1/2 inch, chuck, missing from the top left front corner and minor bumping to the top/bottom spine. I paid $85 for my copy, probably, in 2000. My Knopf edition is in very fine condition with a good dust jacket, showing signs of age, with minor creasing on the front flap, minor tears, and minor bumps to the top of the spine. I paid $35 for my copy, probably, in 2001. How do mine match up against what is available today and what I saw at the Armory show? There are 8 copies of the Hamish and Hamilton, first edition, first printing available for sale, ranging from $33.00 to $1000. For $33.98 you can acquire a "good working copy", in fair condition, missing the back page of the dust jacket. Prices quickly rise to the $200 to $600 level, all with minor, yet troubling, dust jacket or binding issues. Even the $1000 copy, the one I saw at the Armory Fair, is listed with tears to the jacket. Since I am conservative by nature, I'd appraise the value of my copy at $250, given today's market. I remain happy with my $85.00 investment and if I was ever so motivated, I probably could have the dust jacket repaired, since the 1/2 inch tear is simply within the solid black section. There are only 4 copies of the Knopf, first edition, first printing, available for sale, with prices ranging from $49 to $200. The $49 copy is listed in very good condition with a fair dust jacket. The $200 copy is also listed in fine condition with a good dust jacket. Since I only paid $35 for my copy, I must live with dust jacket with issues. These are tears and very tiny chips, mainly on the folds and the top/bottom of the spine. In this case, I like to think that this copy was a copy aged due to time but not mis-use or rough handling! I'd appraise the value of my Knopf edition at $150 in today's market. Again, I remain pleased with my investment and certain that my dust jacket could be easily restored. One thing about book fairs, in general, is the book seller position on pricing. If indeed, the copy of Camus for sale, $1000, I saw at the fair is the copy listed on-line, the seller should be willing to accept a price of $700. The on-line store takes a cut of sales so why would any buyer be willing to simply pay more in person at the fair? In a few, brief, conversations I had with random book sellers on the show floor, I again confirmed that they don't uphold the time honored tradition of the haggle very well at all! is because here is some thing good for the people who loved fashion and related trend.